Give them flowers and stand out from the crowd! Like them or not, teachers are a part of our lives from a very young age and often well into our adult years. They are important because of the role they play in organizing our education, and because of the dedication they show to ensuring the success of each and every one of their students. It's only natural to feel gratitude for their hard work, so what better way to thank them than with unique and creative gifts? Let's face it – the apple is getting a little old, so that's why we've put together some teacher gift ideas for your perusal. Giving a card is always a good basic move, especially when you add in a customized personal message. Combine that card with a bouquet of flowers, a box of chocolates and a gift basket and you've got yourself something that every teacher will love. Not only that, but it's fun and easy too! There's no sense mulling over a billion potential teacher gift ideas when something as simple and enjoyable as flowers are available to you. When you add up the benefits, you can see how an idea like this will not only guarantee your professor's happiness, but bump you to the front of their favorite list at the same time! When you hand them your specially-chosen bouquet of flowers or customized gift basket, you can rest assured that you've given a present that will be greatly appreciated. Not only for its practical application, but also for the fact that decorating the classroom benefits everyone inside! These are definitely good teacher gift ideas, but they're only scratching the surface. For more great information, feel free to contact us at any time. We'll be happy to provide even more great advice for your assistance. Also to your advantage is the ability to shop and arrange for delivery online. Simply start by browsing our selection and then proceed to the secure order form when you're ready to buy. Same-day delivery guarantees mean that your order will arrive fresh and on time – every time. Definitely to your advantage! So if you're looking for great teacher gift ideas, look no further than flowers. 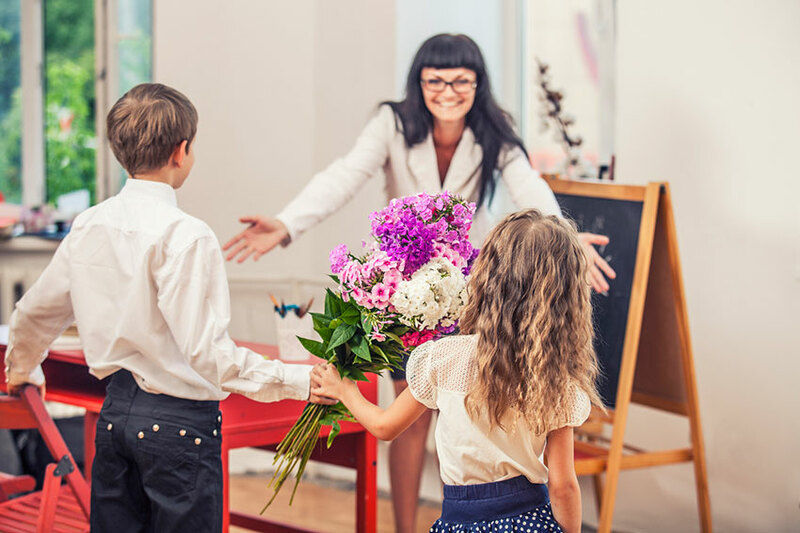 Show you care with style and panache as you hand your teacher something they'll really love. If you have any other questions about flowers, floral arrangements, gift baskets or any other gifts you can think of, please call us at your convenience. We'll be happy to put our years of experience to good use helping you out!